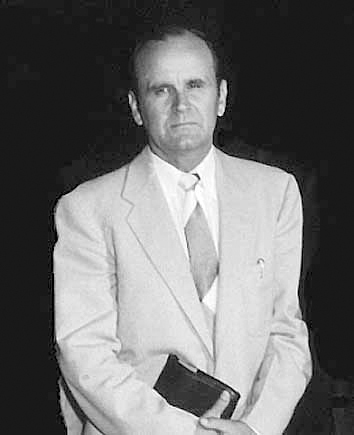 Fisrt born of Charles and Ella Branham, William Marrion Branham was born on april 6th, 1909 in a cabine in the Kentucky and grew up nearby Jeffersonville, Indiana. His father was an alcoholic illiterate with a pour and difficult education. The first day of his life, something very unusual happened. After that the nurse had washed him and put him beside his mother, she went to open the window. The dawn which was appearing at that very moment let some rays come in the room. An enlighted ring entered at the same time and came to shine over the bed where the mother and the new born baby were resting. The supernatural presence of God accompanied this man all along his life. Alerady in his childhood William Branham had had the vision of events that has all come to pass and often, many years later. At least once in his childhood, he had been approached by an astrologer who told him that he was born under a special sign and prophecied that William Branha shall have a great ministry. Later in his life, après un examen d’électro-encéphalographie, a doctor told him: «your subconscious and your conscious are together … so, you can have a dream whilst you are awake». At the age of seven, he heard a voice coming out of whirlwind seeming to happen within the leaves of a tree, whilst there was no wind all around. The voice told him: «Don’t ever drink, or smoke, or defile your body in any way. There will be work for you to do when you get older». Several times in his childhood, had spurred by friends to drink or smoke. They called him coward, nd thaat was precisely what he did not want to be for finally, as a boxer, he manifested that he was not one. Any time he tried to drink or smoke, he could hear that wind noise again and the same Voice that denied him to do such things. This is how he has been kept from disobedience. According to the Bible, Elijah had fist of all heard the storm before that the Lord, The Everlasting One could talk to him at the Horeb mountain (1 Kings 19). Job heard the Voice of the Lord striaght out of the storm (Job 38.1). “And of the angels he says, Who makes his angels winds...” (Heb. 1.7). 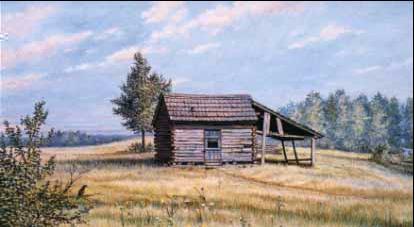 Whilst William Branham was a young man, he had been ordained minister of a baptist church by the Dr Roy Davis. A few time after that, he started a ministry with no connection with particular confession, for he knew himself to be called to the service of the humanity. In June 1933, many things of great importance took place. He held his first evangelizing campaign. 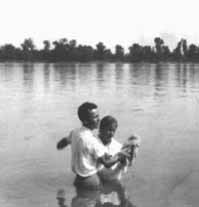 By the end of this string of meetings a baptism service took place in front of almost 400 people, on sunday june 11th 1933, in the Ohio River. Hundreds of new believers had been baptized. When the yound preacher Branham was about to to baptize the seventeenth person, he prayed and said : «Father, as well as I am baptizing them in the water, may, You also, baptize me with the Holy-Spirit then». It is at that very moment that a light came shinning down from the sky like a star and stopped over him. From that light came a Voice saying : «As John the Baptist was sent to forerun the first coming of Jesus Christ, so your message will forerun His second coming». The «Associated Press» of the United States and of Canada, particularly, related this extraordinary event. Because of the extraordinay events that followed each other again later in the life of this man of God, and more particularly concerning the 7 visions received in 1933 about the world development that must be fulfilled untill the End, pushed the other preachers to draw away from him more and more. Even those who where very close to him admitted that such events happened in the biblical times, but they refused to accept that they could happen today again. 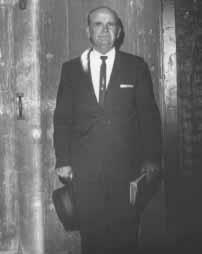 On May 7th 1946, in the evening, William Branham was in a room where he had already spent some time in prayer and Bible reading. Suddenly, around 11:00 PM, a Light came into the room from the ceilling; The Light spread wider and wider and got more intense. He said : «… When I was watching I saw this big star hanging. However it did not have five spikes, btu it resembled more and more to a shinning fireball, and it enlighted the floor. Then I heared some footsteps. Fear caught me a bit more, for I knew that nobody could have come in that place except myself. Within that Light I saw a man coming to me as naturally as you come to me. I guessed that the man could weight around 130 pounds, and he weared a white dress. His face was smooth, without beard, his black hair felt on the shoulders, his complexion was rather dark, and he had a very kind appearance. He drew much closer and our eyes look met. He saw my fear and told me : "Do not fear. I have been sent from the presence of God Almighty to tell you that you particular life and the strange path which is yours show that God has sent you to the people of the earth with a gift of divine healing. If you are sincere and succeed to make people believe in you, no disease could resist to your prayer, not even cancer’’. I can't find words to express what I felt on that very moment». The Angel spoke again to William Branham and said: «As two signs had been given to Moses (Ex. 4), then two signs are given to you. I they do not believe the first one, they will believe the second». Then the Angel explained the first sign to him. After the preaching of the Gospel and the prayer together with those who would have consecrated their lives to the Lord, he should pray for the sick. The first sign consisted in the fact that he should hold the hand of the patient in his own; then the sufferrings of the person should appear on the back of his hand and he shall see what disturbs the person, for the disease manifests itself through the change of the skin complexion and reactions. Then shall come the healing prayer. The patient should follow the event by watching the hand. When the prayer had been granted, and God had fulfilled the healing, the sign that identified the disease should disappear in front of the patient. This way of announcing the Gospel had been vindicated several times, and most particualrly between the years 1946 and 1949. Many of the people who were healed by the mean of such a miracle of God felt it within their bodies and saw this healing getting fulfilled instantly, and many was those who were shouting loudly as they were touched by this work of God. Then the Angel explained to him the use of the second gift, by quoting several biblical statements. He referred to the ministry of our Lord Jesus, explainig to him in a particular way John 5:19-20, saying that Jesus as the Son of Man, acted as a prophet, having visions that showed Him what God wanted to fulfill. “Verily, verily, I say unto you, The Son can do nothing of himself, but what he seeth the Father do: for what things soever he doeth, these also doeth the Son likewise. For the Father loveth the Son, and sheweth him all things that himself doeth…” (John 5:19-20). In conformity with this Word, The Son of Man had fulfilled His ministry according to what was shown to Him in visions. The Angel mentionned the two events of John 1, concerning Peter and Nathanael. We read that, when lorsque Andrew led his brother Simon to Jesus: “Jesus looked upon him, and said, Thou art Simon the son of Jona: thou shalt be called Cephas (which is by interpretation, Peter)” (v. 42). He had never seen Peter before, but nevertheless He knew his name and his father's name. The same happened with Nathanael, that Philip led to the Lord : “Behold, an Israelite indeed, in whom is no guile… Before that Philip called thee, when thou wast under the fig tree, I saw thee” (v. 47-48). Everyone can read and see how touched was Nathanael by this revelation, and how he reacted. The Angel continued referring to John 4 and He brought up the conversation that took place between the Lord Jesus and the Samaritan woman at the Jacob's well. By revelation, and in conformity with what has been shown to Him, Jesus told her: “... for you have had five husbands, and the one whom you now have is not your husband” (v. 18). By the end of the conversation, the woman cried out: “The woman saith unto him, I know that Messias cometh, which is called Christ: when he is come, he will tell us all things. Jesus saith unto her, I that speak unto thee am he.” (v. 25-26). The Angel referred to other biblical passages again where similar events happen, where the prophetic ministry of the Son of Man appears particularly. It is precisely at the time of the manifestation of this ministry of the Son of Man that the Pharisees had sinned by saying : “It is through Beelzebul that He does these things!”, and so on. As a Prophet, the Son of Man could even recognize the motives and the thoughts of he heart, and that was precisely and particularly what did not please at all the spiritual leaders of that time. Meanwhile, this is how the spirits were discovered and separated. The Lord God had said to Moses: “ will raise them up a Prophet from among their brethren, like unto thee, and will put my words in his mouth; and he shall speak unto them all that I shall command him” (Deut. 18:18; Acts 3:22-23). The Angel said again that this very "Sign of the Messiah" should be manifested today again in the Church of the nations, as well as it has been in the past among the Jews and the Samaritans. At the beginning of almost all the healing services that he had, William Branham referred to these passages of the Scriptures that the Angel literally explained to him. The second gift consisted in the fact that, in conformity with the precision that God could show him during the healing service, he could tell the people which country they came from or which town the came from, what their names was, who they was, which disease they had, and, in other words, everything about them, as it had happened in the prophetic ministry of the Son of Man.